It is Jack’s fifth birthday and he is eager to start celebrating. His Ma has promised him a very special day with a real, homemade birthday cake - Jack can hardly contain his excitement. The cake is a success. But there are no candles. And there are no presents. Frustrated, Jack lashes out at his Ma. However, there are limitations in Jack's world. Many things are just not available to him. The reason? He and his Ma live within the confines of a small shed - a place that he calls Room. Click Here For Weekly Film News, Reviews And Events! 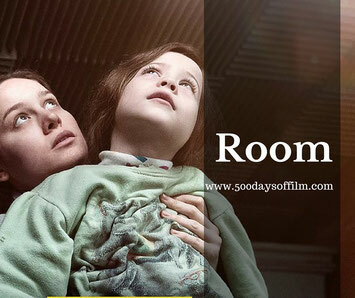 Lenny Abrahamson's stunning film, Room, is based on Emma Donoghue’s gripping book (also called Room). I watched Room as part of Odeon’s Screen Unseen event. No one in the audience knew what was about to be screened until the BBFC certificate appeared. I would have been happy with any film, to be honest, but I had heard great things about the performances in Room and so I was well pleased that this was the secret film of the night. Not everyone shared my opinion, however. Five minutes in and four people left. I am, even now, wondering why. What were they hoping for? How could they tell so soon that this was a film they wouldn’t be able to stand? Who knows… people even walked out of the Screen Unseen screening of Inside Out so there is really no accounting for taste. I wonder if those walk outs were prompted by a fear of the harrowing film to come. That I can understand. The opening scenes of Room are claustrophobic and distressing. However, once Abrahamson has set his scene, Room becomes a surprisingly uplifting film experience. I loved Room. It is not the film that you think it is. Yes, there are deeply upsetting and unsettling scenes. Yes, I was in tears on several occasions. However, I also laughed much more than I thought I would. The reason for this, given the circumstances, is Jack. Here is a five year old boy who, thanks to his mother’s imaginative spin on their situation, has no idea that he is living in a nightmare. Jack looks at his world with a sense of wonder and this, despite his limited experience, is often extremely inspirational. He may be a child, but his innocent outlook on life saves his Ma on more than one occasion. Jack is played by Jacob Tremblay. I can’t imagine how Room’s filmmakers got such a wonderful performance out of such a young boy. He is just incredible in this movie. Hilarious and heartbreaking, vulnerable and yet fiercely resilient. He made me laugh and he made me cry - Tremblay's performance blew me away. The relationship between Ma and Jack is handled perfectly. The pair feel utterly natural together - even in the most unnatural of circumstances. Director, Lenny Abrahamson, wanted to find an actress to play Ma who could handle the drama but who could also infuse the film with kindness and humour. He wanted to find someone who could bond with a child actor and make that young person feel secure. Hers is not a showy performance. It is not all hysteria and hand wringing. It is quiet and calm, humorous and haunted. And that is no easy thing to pull off. Her expressions speak volumes - they show us what she has had to endure and how fiercely she will protect her son. While Room is largely focused on Ma and Jack, it also features outstanding supporting performances. It is fantastic to see Joan Allen again - she is so powerful in this movie. In addition, William H Macy shines in every second that he is on screen. It would be easy to miss Room because of a fear about its harrowing plot. This would be a mistake as this film is much more than the sum of its set up. I’ll admit that I was a bit of an emotional wreck after watching Room. But this film has (and will) stayed with me - not because of the horror, but for the wonder of a child’s inspiring outlook on life. I absolutely love Odeon's Screen Unseen events. I would highly recommend them. It is fun to try to guess what the film will be from Odeon's social media clues. And then there is a real feeling of excited anticipation among the audience just before the film is revealed. There is also something satisfying about seeing a film weeks in advance of its general release. If you have seen Room, I would love to know what you thought about this film. I think I am about recovered from watching Room with you Jane! As you know I pretty much blubbed my way through the second half of the film. Having not cried through a film that much since The Notebook I went to work on Tuesday with a more than a hint of puffy eyes! I must say for the first 15/20 minutes or so I couldn't really see where the film was headed and I was concerned that I would find it disturbing. And of course, the subject matter is disturbing but like you, in the end I found myself leaving the cinema feeling uplifted (and emotionally drained!). Within this horrific situation both Ma and Jack are full of imagination. Ma created a world within Room for Jack that most of the time was a creative, active, safe (when it was just the of them) and nurturing (he seemed to read well to me). They was no doubt for either of them in their love for each other. I felt so so sad for Ma when Grandpa struggled to connect with Jack, due to the nature of his conception. Their bond, so believably portrayed by the utterly compelling performances of Brie and Jacob, is the reason that this film has stayed with me. Despite the emotionally battering I would recommend Room. On a separate note I loved Screen Unseen! The element of surprise was fun and it meant that I watched a film that I may have chosen to avoid (self preservation!) had I known more about the plot.